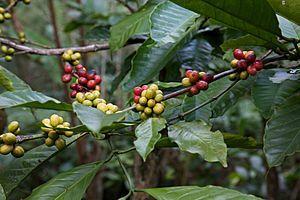 This page is about the biology of coffee plants. For the beverage, see Coffee. 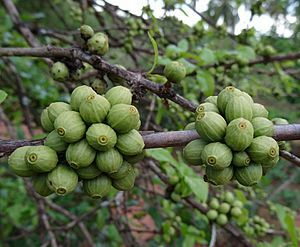 Coffea is a genus of flowering plants, some of whose species produce seeds called coffee beans which are used to make various coffee beverages and products. 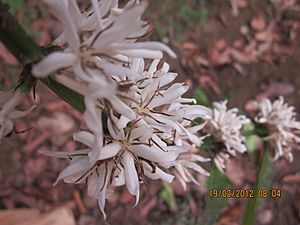 It is a member of the family Rubiaceae. They are shrubs or small trees native to tropical and southern Africa and tropical Asia. Coffee ranks as one of the world's most valuable and widely traded commodity crops and is an important export product of several countries, including those in Central and South America, the Caribbean and Africa. When grown in the tropics, coffee is a vigorous bush or small tree that usually grows to a height of 3–3.5 m (9.8–11.5 ft). Most commonly cultivated coffee species grow best at high elevations, but do not tolerate freezing temperatures. Coffea Facts for Kids. Kiddle Encyclopedia.